While the first non-Honeycomb Android Tablets had been "stumbles" to say the least, they were poised to come back with a vengeance with the introductions of dual core processors. 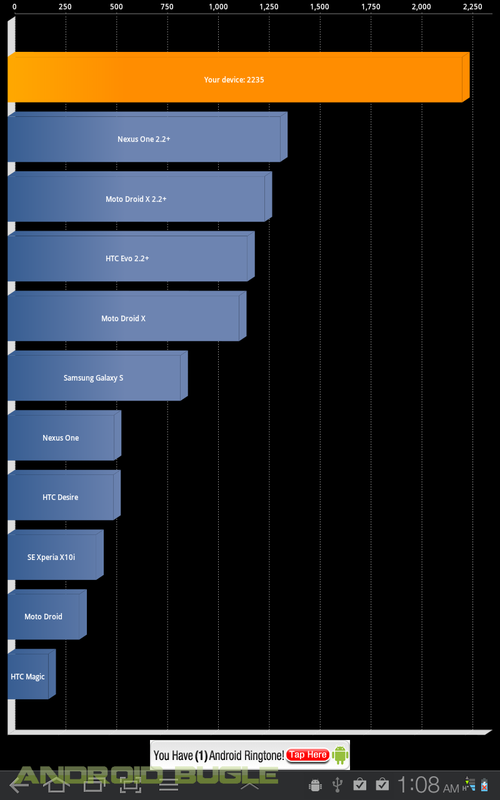 Tegra 2 was the first to break the ice (at least in the mainstream) in the mobile space. Since the beginning of 2011 many phones and tablets have been shipped powered by the chipset. In comes the Samsung Galaxy Tab 10.1, it certainly wasn't the first tablet on the scene but it was the first to really prioritize form as well as functionality. This of course has caused quite a stir in the tech world as a competing company, named after a specific fruit, has gone out of its way to try to block the sales of the Galaxy Tab 10.1 in many countries. Today we review the HSPA+ version from Bell to see what all the fuss is about. The Samsung Galaxy Tab 10.1 is without a doubt one of the most attractive tablets we've gotten the privilege to review. In fact, the company came forth and admitted that competing offerings were so far superior to the first versions of the 10.1 that it warranted delaying the product to perform a complete redesign. We certainly agree with the resulting product of the delay is fantastic. When deciding on a tablet, thickness and weight are even more primordially important factors than on phones. Being primarily content consumption devices, good ergonomics are of utmost importance. The Samsung Galaxy Tab 10.1 certainly delivers, being one of the thinnest and lightest tablets available on the market. Clocking in at an ULTRA slender 8.6mm and 565g the Samsung Galaxy Tab is one of the thinnest and lightest tablets on the market. The gold standard for tablets was of course the iPad 2 and the Galaxy Tab 10.1 beats it on both fronts. But as we all know thinness and good build quality is certainly something that is difficult to achieve. The Galaxy Tab 10.1 is made primarily of plastics, which is probably how it attained such low weights. This also means there is a bit more give when trying to bend the tablet. Now of course we don't expect anyone to abuse their tablet enough to bend it to the point of breaking but it does concern us for buyer who might be students who might throw it in their bag with a bunch of heavy textbooks that could potentially do some damage to the tablet. While in a sparsely filled back the Tab was safe, we certainly don't recommend taking a chance in a more crowded bag without some sort of protective case. Another downside of a mostly plastic build (especially with a glossy finish) is that the tablet then becomes a fingerprint magnet. If you are the obssesive compulsive type that needs to keep their devices fingerprint free you will either want to keep a shammy on your person or put a case on the device. Our test unit was the white version so fingerprints weren't as apparent but we expect people who get the black version to certainly find it bothersome. Like with Samsung's Galaxy S line of smartphones compared to the well known iPhone, the Galaxy Tab 10.1 is more or less reminiscent of the ubiquitous iPad. The similarities have even drawn the attention of Apple who has aggressively gone for import bans of the Galaxy Tab 10.1 in several countries. That being said whether the design was "inspired" or not, it is the ideal form factor for content consumption. There is however a significant downside to having such a thin profile is the lack of several ports and expansion slots. Unlike competing Android Tablets, the Galaxy Tab 10.1 features a minimalistic amount of connectors which are the 3.5mm headphone jack, the SIM card slot (for the 3G/4G version) and the proprietary Samsung Charging and Sync port on the bottom of the tablet. Samsung has undoubtedly been a leader in display technology for several years and it has really shown in the Galaxy S line of phones equipped with Super AMOLED display. While AMOLED display haven't made their way to TV displays and Tablets, Samsung has a viable alternative in PLS displays and that's what they use in the Galaxy Tab 10.1. While PLS displays don't have the vibrant colors or the deep blacks of the AMOLED they certainly rank up there with the Super LCDs and IPS displays of the world. Viewing angles were fantastic and in outdoor use the PLS was surprisingly decent. Colors, contrast and brightness were top notch, we'd put it on par to the ASUS Transformer and the iPad 2. Responsiveness of the touchscreen was excellent, as expected. Multitouch gestures worked great and accuracy was as good as we've seen on any other premium Android device. Being an Android 4.0 Honeycomb powered Tablet, there are no set Android buttons anywhere to be found as the controls are rendered in the OS itself. This coupled with the fact that the Galaxy Tab 10.1 follows an ultra minimalistic design means the tablet really only has two buttons Power and Volume rocker which both felt good in travel and pressure but were a bit too flush to find without looking. Sporting a 7000mAh battery would imply that the Galaxy Tab would have fantastic battery life and it sure delivered. The Galaxy Tab we tested was the Bell "4G HSPA+" version there for had an additional radio and fortunately this did not hamper battery life in any way. We easily got through two and a half days on a single charge with moderate to heavy usage. While the Samsung traditionally likes to keep the processors for their smartphones in house this wasn't exactly possible with the first wave of Android Tablets powered by Honeycomb as the first two major iterations only supported nvidia Tegra 2 processors. 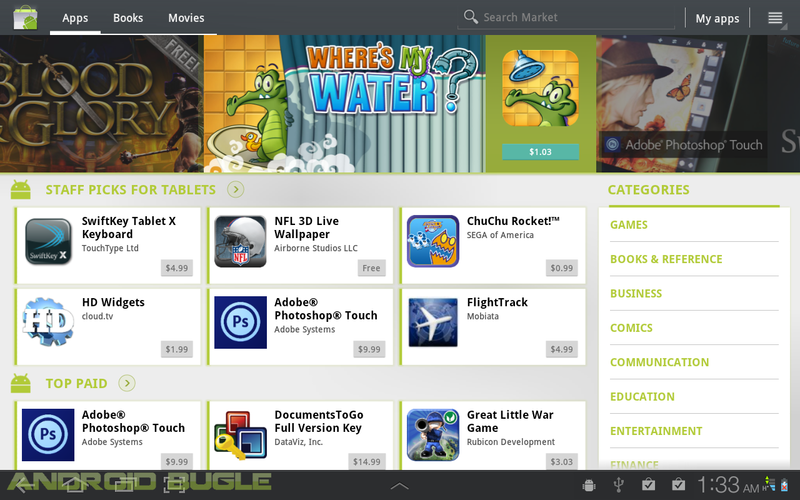 So of course the Galaxy Tab 10.1 is equipped similarly to other first wave Honeycomb tablets. As with most of the Tegra 2 powered Android devices overall performance was quite good and was really phenomenal in 3D and gaming. Download speeds would often be between 3-6Mbps which is sufficient for just about all your multimedia and web surfing needs on a device like the Galaxy Tab 10.1. Upload speeds were a bit of a disappointment. Hovering around 0.6mbps this is not really idea for uploading heavy content like videos or photos taken with the Tab. As with any speed tests, your mileage will vary (for better or worse) and these tests were conducted in Montreal in several areas with moderate to good coverage. The Galaxy Tab 10.1 is equipped with stereo speakers that can be found on either side of the tablet when held in landscape orientation. As with any built in external speakers they are decent but won't be a showstopper by any means. They will certainly be good enough for the non audiophile to enjoy but for those who want to fully enjoy their music or videos we suggest investing in a good pair of headphones. As with most tablets the rear facing camera is decent but really not the ideal picture taking device. Factor in the ackwardness of taking snapshots with a tablet and we don't expect anyone to make the Galaxy Tab their primary shooter. As for the front facing camera it is just like most other front facing cameras and it's usage will probably be limited to vanity shots. Overall picture and video quality on the Samsung Galaxy Tab 10.1 was as one would expect of any tablet, not great but just good enough for those time were you need a quick snapshot.The 720p HD recording was decent but again, the formfactor of a tablet really limits when one can use the tablet for video recording without really looking out of place. NOTE: During the writing of this review the usual sample pictures and video taken with the device were misplaced and could not be found. Subsequently, this review will sadly not include any camera samples. Just like every other non-Nexus offering from Samsung the Galaxy Tab 10.1 has a manufacturer UI and is equipped with Android 3.1 overlayed with TouchWiz UX for tablets. Of course many Android enthusiasts will not appreciate thecustom UI but there are certainly some worthwhile additions in this iteration of TouchWiz. TouchWiz unlike on Samsung's phones tweaks in Android 3.1 are mostly all cosmetic, like the color and icons in the Settings menu, the different Widgets available, the fonts fount across the UI. There are however severl functionality changes as well. For one the bottom dock hosts a tray of "quick apps" that can be launched at any time and do not take focus away from your current app. On a personal note, I found the Notes app and the Calculator app to be extremely invaluable and was great to be able to pull up while browsing for example. What was somewhat alarming though was the responsiveness of the Galaxy Tab 10.1 compared to a more stock device like the ASUS Eee Pad Transformer. Since both tablets use practically identical specs it most probably comes down to a software culprit. We can imagine it probably has something to do with TouchWiz UX or the fact that the Eee Pad is running Android 3.2 rather than 3.1 on the Galaxy Tab. As with anything subsedized by a carrier our Galaxy Tab review unit was a Bell version thus included some Bell apps, but nothing overly offensive. The Samsung Galaxy Tab 10.1 is certainly one of the nicer Android Tablets and overall one of the nicer tablets out there. It packs the full features of most other Honeycomb Android tablets while packaging it into a slim and sleek form factor. In the end the Galaxy Tab 10.1 is tailor made for on the go content consumption like web browsing, YouTube viewing, social networking, etc. The problem there are other tablets that also do it just as well if not better. If you are considering the Galaxy Tab you probably won't be disappointed just keep in mind that there are comparable tablets at lower price points if thinness and weight are not major priorities. - PLS is a FANTASTIC substitute for AMOLED. 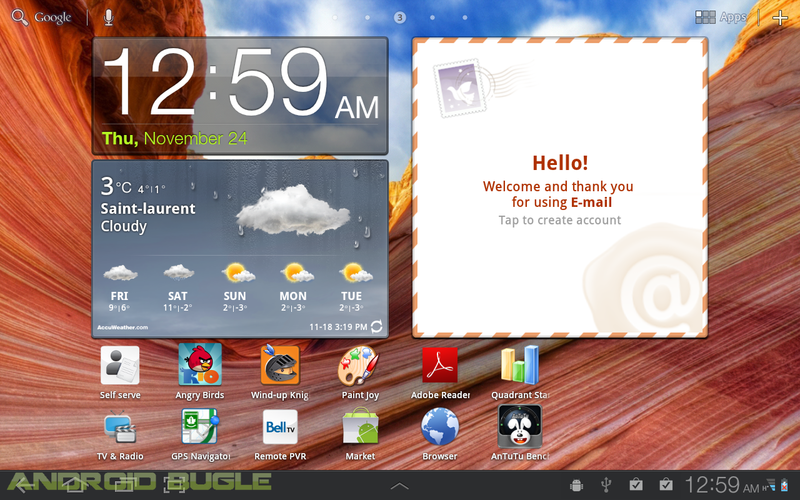 one of the best screens on any tablet on the market. - Power and volume buttons a bit too flush but good feel and travel. 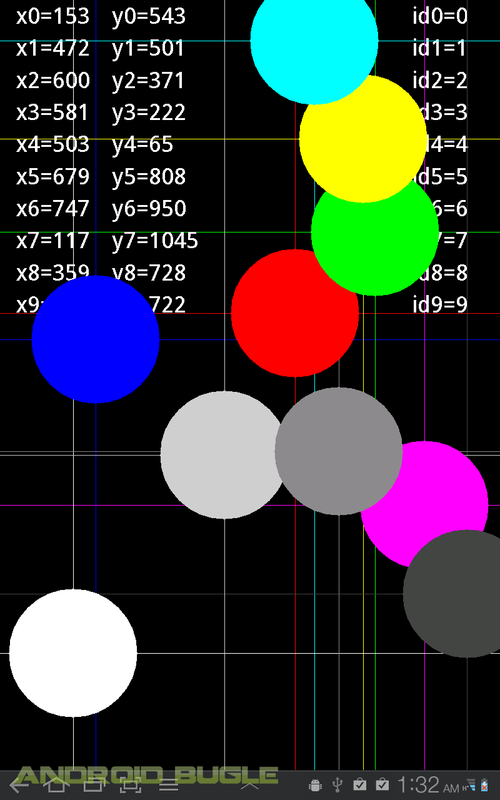 - Tegra 2 delivers stellar graphical performance. Decent overall performance. 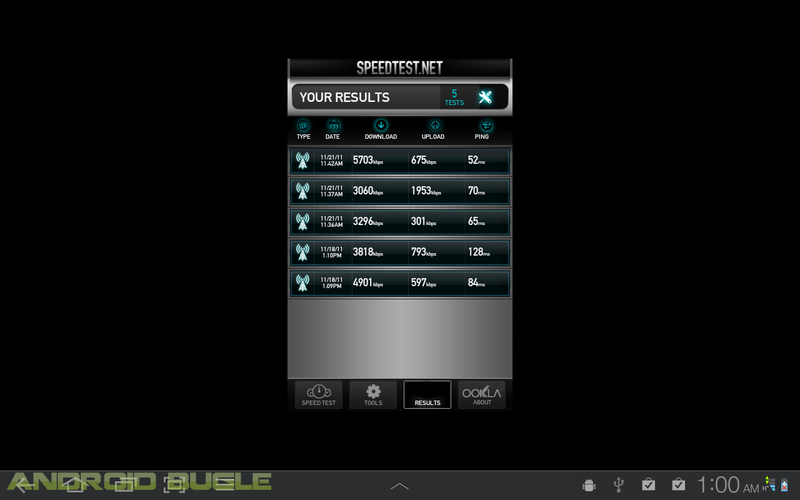 Okay HSPA+ speeds, but we've seen faster on the Galaxy S II. - Decent speakers, but stick with a good quality headset. - Average front and rear cameras, decent low light performance when used with flash. 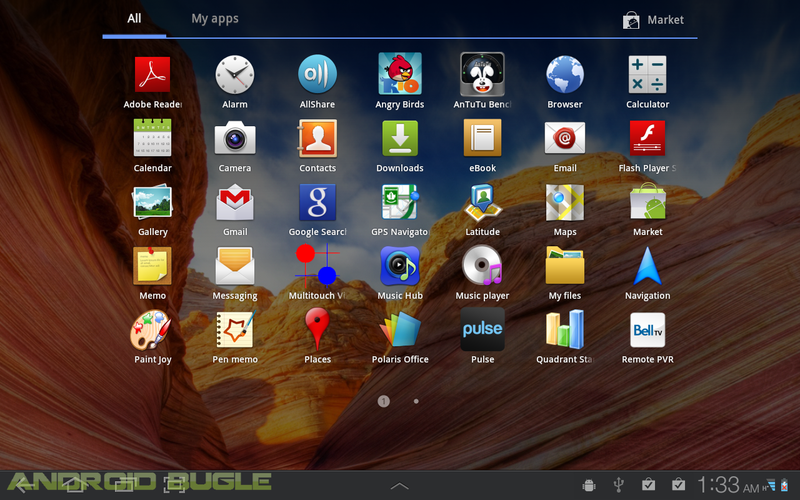 - TouchWiz UX definitely adds some functionality but really makes the hardware pay for these extra features. Noticeable sluggishness in some part of the OS. 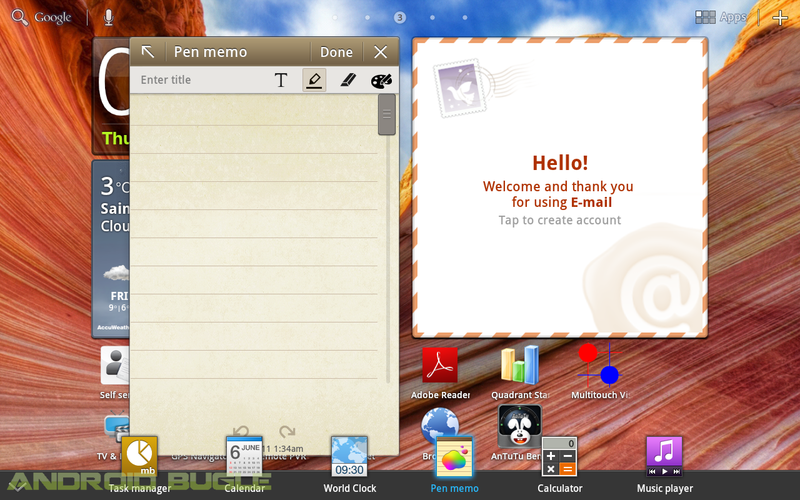 - Quick Apps launcher is a fantastic implementation of mini-apps and makes the tablet feel closer to a desktop/laptop experience. - Limited apps pre-loaded but none could be removed, we would like to see less.